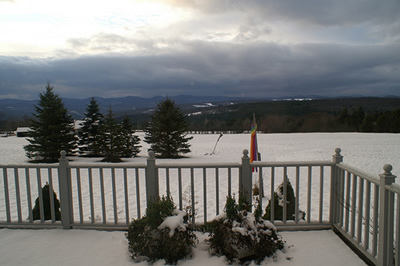 Beautiful and snowy at my parents' place for Thanksgiving, and yes, this is the view from their living room. The turkey was delicious, the stuffing bad for me, the candied yams so full of butter and sherry that I forgot they were originally tubers. Of course, Thanksgiving now involves other traditions. This year, my brother and I helped take the lawnmower attachment off his sit-down lawnmower and put on the snowthrower. I'm slightly less handy than a one-armed man without thumbs, but I helped around the periphery. We had good, traditional Thanksgiving. Much food, enjoyable conversation, and time with beloved family. It strikes me as so very strange that we have the quintessential Thanksgiving: New England, and family that can get together without screaming, sulking, of sniping. For this, and for the reasons behind it, I am extremely thankful. If you'd like a window into my family's thanksgiving, my brother took many pictures, and posted them to his flickr site. Case in point, the fascinating, if incredibly one-sided 'argument' between a group of professional authors and the editor of SNM Horror Magazine. "You are so blind. You don't understand, you weren't there at the beginning. You don't know how good it was, how important. This is it for you, this jumped-up fire-work display of a toy advert." Simon Pegg has articulated my feelings better than I've been able to. Go buy Spaced and see what all the fuss is about. An interesting bit I've heard kicked around the Internet is: "If Obama is elected, the first thing he'll do it take care of his own people." One concept in semiotics is the level of abstraction, a phrase that assigns a framework to the attributes we assign to an object. What categories we put it into. Obama is; the son of a 'broken' home, the son of a Kenyan, a lawyer, a husband, a male, a world-traveler, a Harvard graduate, a senator, a professor, a father, an admitted former drug user, a smoker, a published author, former editor of the Harvard Law Review, a basketball player, a successful politician, and a human being, a comic-book reader, and a liberal, among many other designations. To single any one out, I think, says a great deal more about the individual interpreting the statement than it does about the president-elect. There’s a certain amount of trepidation involved in reviewing an American classic. Apocalypse Now is extremely popular, regularly placing in most top 50 lists, and even gets a reference in Buffy the Vampire Slayer. It’s one of those 500 pound gorillas of film, most film makers assumed that you’ve seen it. And I haven’t. Or hadn’t. First, I should say that I come at it from a different place than most people. I should have read Conrad’s Heart of Darkness before I saw the film, simply because I like to have a bit of background before I take on a classic. However, I have read King Leopold’s Ghost, which recounts the atrocities that happened in the Belgian Congo that form the backdrop of Heart of Darkness. So yes, the majority of the atrocities described in the book (which I haven’t read yet) are based on reality, rather than being metaphorical, which I believe is the assumption. I’ve also read Kim Newman’s novella “Francis Ford Coppola’s Dracula” which mixes his Anno Dracula universe with the experience of creating Apocalypse Now. Apocalypse Now is an extremely American film. It involves one very American metaphor while employing the central motif of the uniquely American genre, the Western. Ever since Huck Finn, the river has been a metaphor for life in American literature. The protagonist drifts down the river, and sees all the random places that it takes them, and the strange people they meet. Apocalypse Now utilizes this metaphor of the river as life, merging it with the Greek river Styx, which the dead had to cross over in order to get to Erebus (the name of the boat Captain Willard takes). This is an American journey down the river Styx into Hell. Additionally, Apocalypse Now is a Western. Ken Hite in his Dubious Shards (yes a secondary source, I need to read the originals) says that the central conflict of the Western is this: Anyone who picks up a gun is a barbarian. Yet only someone with a gun can deal with a barbarian. In the best of Westerns, this leads to conflict for the hero. In Apocalypse Now, Kurtz is repeatedly said to be effective. He was an admirable, civilized man who achieved great things. Yet his actions are so barbarous that the price of victory is too great to be bourn by a civilized nation. Which is why the protagonist, Willard, is dispatched to take him out. The phrase “Terminate... with extreme prejudice” is popularized in this film. In addition, many Westerns, especially those of John Ford, use the landscape as a character. Ford often uses a sweeping establishing shot of the landscape to establish mood. In the same fashion, Coppola uses the lush Philippine jungle to convey the differentness of the jungle from urban America. With these two metaphors firmly in place, the film moves very strangely, in what is likely a deliberately surreal fashion, from farce to horror. The majority of the farce is delivered by the famous character of Lieutenant Colonel Bill Kilgore. Kilgore, the epitome of subtlety in character naming, is an arrogant loose canon who gets his men and civilians killed because he uses military means to achieve nonmilitary objectives. Either the narration is right and Kilgore will get through the conflict without a scratch, in which case his invulnerability makes his presence intolerable since he risks nothing while his men risk all, or he is not, in which case he’ll take a bullet off-screen at some later date. He is supposed to represent all that is crazy and wrong with the officers in Vietnam. He seems overly-ladled with insanity and lacks complexity. Yes, he helps the child toward the end of his sequence, which is supposed to be an encapsulation about the contradiction of the way Americans treat war. We’ll gun down enemies, and then help to fix up the wounded. I found him broadly painted, and lacking in nuance. I find Coppoloa’s hand too heavy on the film. A lot of time is spent showing us the absurdities, and he wants to make sure that we catch them all. Kilgore’s role could have been reduced significantly, giving us a background taste of his madness, instead of a front-row seat. But the sophistication of audiences is different than it was in 1979, we are much more used to picking up minor cues and taking a large inference from them. The film is at its best when the boat is on the river. We watch passively, with our own thoughts as the fog and green miles pass us slowly by. Coppola evokes mood beautifully utilizing the local jungle and fog. The image of the bomber’s tail sticking silently out of the river is one of the most powerful of the film. Rather than preach at us, Coppola allows the audience to look at this enormous thing that appears out of the mist, and consider what we know about it. Something that cost America millions of dollars, and was crewed by six or seven men. Where are they now? We don’t know. What was it bombing when it went down? We don’t know. How was it shot down? We don’t know. Those questions with empty answers made a stronger impression on me than Kilgore’s Wagnerian madness. The ending is a bit of a disappointment. Kurtz becomes Frazier’s Corn King, and Willard the one who will kill him and receive the worship of the simple natives. Coppola does not spend any time investigating the culture of these people, but simply allows us to know that a charismatic white man has made himself the local god-emperor. It was a perfectly cricket assumption in ‘79, but it hasn’t aged well for me. Hollywood still employs it, however. In Dances With Wolves, the white man goes native and then shows the Indians how to live their lives, and I didn’t bother to watch the Cruise film where the white man shows the Japanese how a samurai honor should be maintained. This cultural arrogance sticks in my craw. Apocalypse Now Redux’s perfect metaphor is contained within itself. Like Marlon Brando, it arrives with great ballyhoo, only to show itself bloated and unprepared. While it has some genuinely astonishing moments, they are buried in a lot of self-indulgent rambling. This is why I don’t review films.